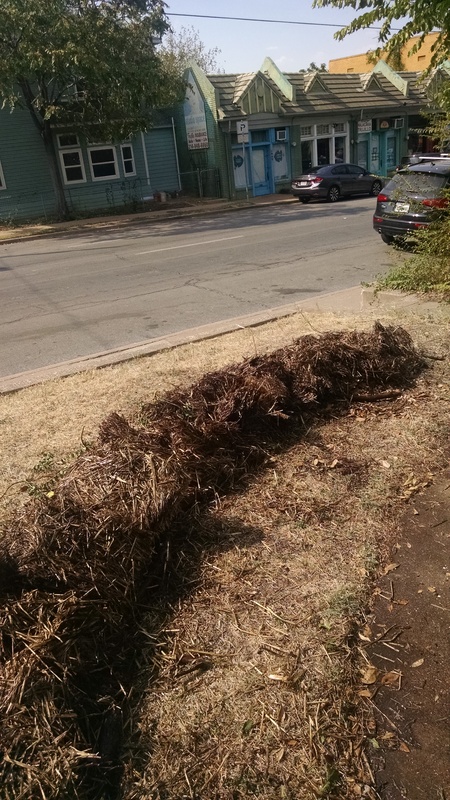 We’ve been busy here at the urban homestead…. 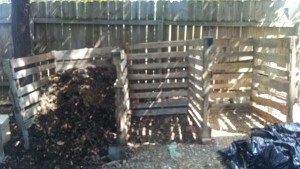 First, we salvaged several pallets to start a measured compost pile. Now, there are many ways of composting – from piling some vegetable matter in a heap and walking away … for as much as a year. After all everything composts eventually. All the way to the 18-day Berkeley method that requires careful building and turning religiously throughout the 18-day period. I chose to go with a medium-time way. Pallet-walled bins that allow turning on an occasional basis. We’ll have compost within a month or so. In fact, much of the vegetable matter that went into the bin were composting of themselves in the plastic bags! With the chicken-coop litter, nitrogen was incorporated to help heat the pile up. Made sure it was damp and then covered it with a tarp. 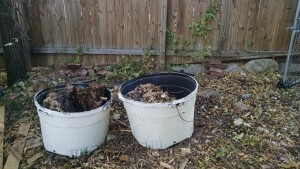 It was great to have the bins made…I’d been using old tree-planters and before that a little galvanized can. 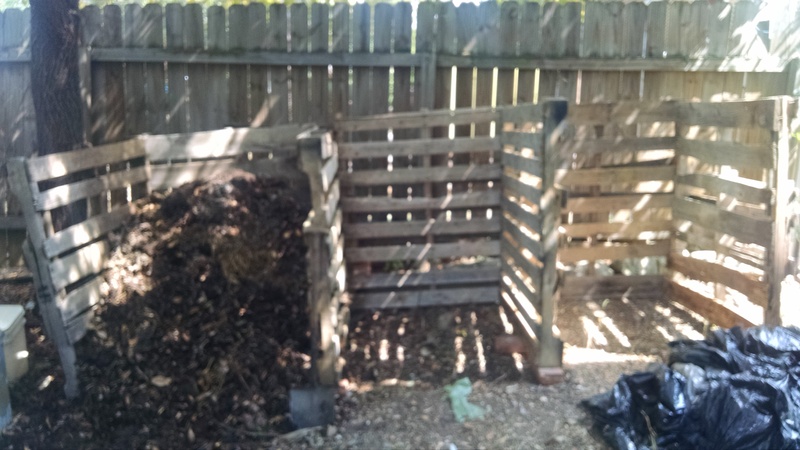 The bin method will suit me, because I’ve been expanding my planting areas in the front yard and will need a bunch of compost to complete it. 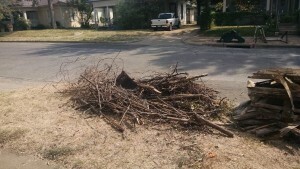 We cleared the backyard of downed and cut branches and sticks and put them on the street for the bulk pickup. But THEN…. we decided to start another growing bed – in the ground, actually, rather than in a container (!). So we took the pile down by half by laying out the sticks and branches to form a narrow, curving bed to follow the walkway in a portion of the front yard. Then, because my straw bales had seen better days for growing (after all, they had survived two seasons! 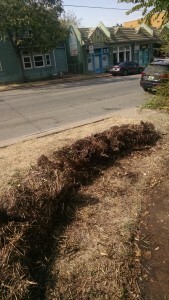 ), they went on top of the sticks, mixed in with some leaves I begged off the landscapers at my bank. Next, we’ll put more vegetable matter on the bed, then top it all off with mulch and plant. This type of bed is called “hugelkultur” which is a technique that has been used in Eastern Europe for centuries. (See my earlier postings on hugelkultur – they are more detailed.) BUT….the essential thing about this technique is that it retains water. That’s what we need in dry times, like we’re having now. As the wood on the bottom decomposes, not only does it serve as a habitat for fungi, particularly mycorrhizal fungi (which are so important for the soil food web), but the wood becomes like a sponge and holds water. Remember this – if nothing else – the more organic matter we can put into the soil, the more water it will hold when it rains, and the less you will have to water your plants! Posted in compost, compost bin, garden, gardening, hugelkultur. 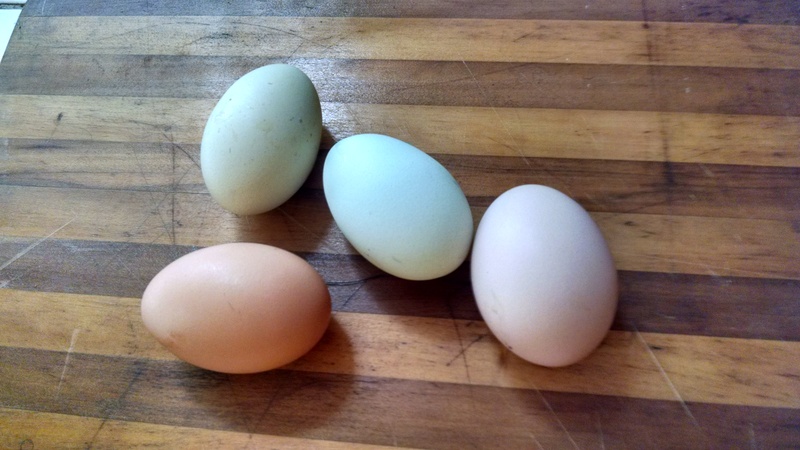 Fall is here, and egg production is beginning to ramp up in the coop. I guess it’s the cooler nights and not-so-hot days. 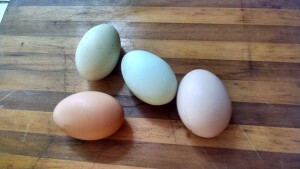 All three Ameraucanas are now laying….with an occasional egg from the Rhode Island Red. But I’m still waiting for the Black Cochin and Black Austrolorp to come online. I’ll supplement their feed with some more protein – yummy meal worms and maybe some calcium to help them along. I was reflecting the other day how going out to take care of the chickens in the morning has become a time of untime. I move into a zen and no-time, as I care for them, cluck at them and generally carry on the morning conversation. It would seem odd to hurry through the routine. Chickens truly are a stress reducer… ask anyone who has sat and watched them scratching as they foraged. I’ll be teaching strawbale gardening on October 3, Saturday, 10 am at Trinity Haymarket (1715 Market Center Blvd). The class is free, and the proprietors Bill and Fred have coffee and pastries to munch on before the class begins. You can learn how to condition strawbales organically to grow (especially) greens for the winter. Strawbales are excellent choices for a temporary garden, a garden for not bending over, or just plain fun! and when the season or two the bales last are over, you have COMPOST! Also come and check out Trinity Haymarket’s new offerings – Sojos freeze-dried, no-grain dog food. Super nutritious, as well as local honey, chicken and bee supplies as well as organic garden supplies. It’s like an old-time feedstore and really fun to visit. Posted in backyard chickens, chickenkeeping, chickens, garden, straw bales.